Fitness & Nutrition is a vital component linked to the RESULTS we see! So you better “Watch Your Mouth!” in terms of what FOOD you put in it of course! SusieQ, says: "Watch Your Mouth!" 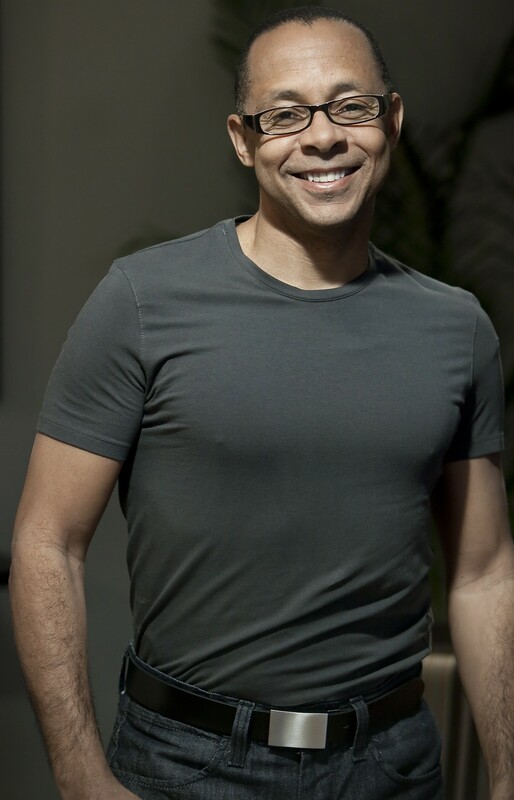 As a Celebrity Fitness Trainer, it is important to work on creating a healthy lifestyle and lead by example. SusieQ struggles with her weight and is a “professional fluctuator”. She faces the same battles like everyone else, which allows her to have the natural ability to relate to people. It is not easy to “Get a FitLife” it takes constant work and involves many elements of Physical Fitness, Nutrition, Emotional and Mental State of well-being. It is extremely important that we improve the health of people right within our own communities. The goal is to reach millions of people around the world through developing a Health/Fitness, Lifestyle & Entertainment TV show that will impact and improve many lives. Watch SusieQ FitLife on YouTube to receive tips on how to live a healthy life with balance! You can catch her “SusieQ FitLife: Arms of a First Lady” (AOFL) fitness DVD, creating a serious buzz and making history within retail giant stores with live health/fitness discussions and in store signings, which has never yet happened before! Sherri Shepherd from ABC’s The View has been Tweeting with excitement about it! The DVD is available online and in Barnes & Noble, Amazon & Best Buy stores now! This debut kicks off her new series of DVD workouts! AOFL is a full body workout system that targets the arms and can benefit everyone from around the world to help people reach their fitness goals! "Watch Your Mouth!" SusieQ & Sal Fichera! “Watch Your Mouth!” is the BONUS Feature on the DVD which is already helping people to learn what to eat, how frequently to eat and when to eat plus so much more! Now you can get into shape and feel confident and great about yourself! Aren’t you worth it? Someone, please shout “YEAH” and let’s keep it moving! Take it from SusieQ, a nationally recognized Celebrity Fitness Trainer, who has Gayle King, Editor-at- Large of “O” The Oprah Winfrey Magazine & XM Radio Host, asking: “How do you get arms to look like that?” SusieQ has the ability to teach Dr. Oz, innovative “Ultimate Flab Buster Workout” moves to rock a studio filled audience. There are no limits to who SusieQ can motivate! 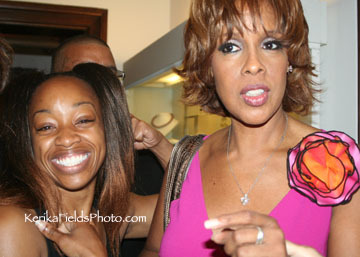 Gayle King asks, SusieQ: "How do you get arms to look like that?" SusieQ shares her formula for good health, and great variety of training techniques so you too can have the guns, right from her (AOFL) DVD! Combine her dynamic one-of-a-kind energy, part drill sergeant/part best friend attitude; you’ll be able to see the results of your body becoming more toned and you’ll be wildly entertained at the same time! SusieQ’s passion for fitness and health started early. In elementary school, she was already teaching her first exercise class. In high school, she discovered weight training and gave with the same enthusiastic vigor. 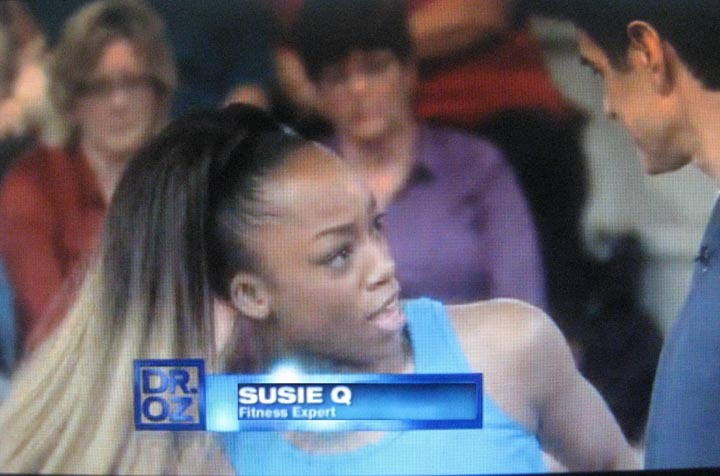 SusieQ is an AFAA Certified Fitness Instructor with a flair for unique programming. Her signature classes “SusieQ Sculpt, Butts n’ Guts”, “Tour De SusieQ” as well as Cardio Kickboxing, Burning Point, Body Sculpting, Spinning, and Dance/Salsa/Hip Hop Aerobics. Working with the aging population, SusieQ also provides Silver Sneakers training in part with MetroPlus Health Care. Let SusieQ Give You Arms Of A First Lady! SusieQ will Produce RESULTS 4 you TOO! 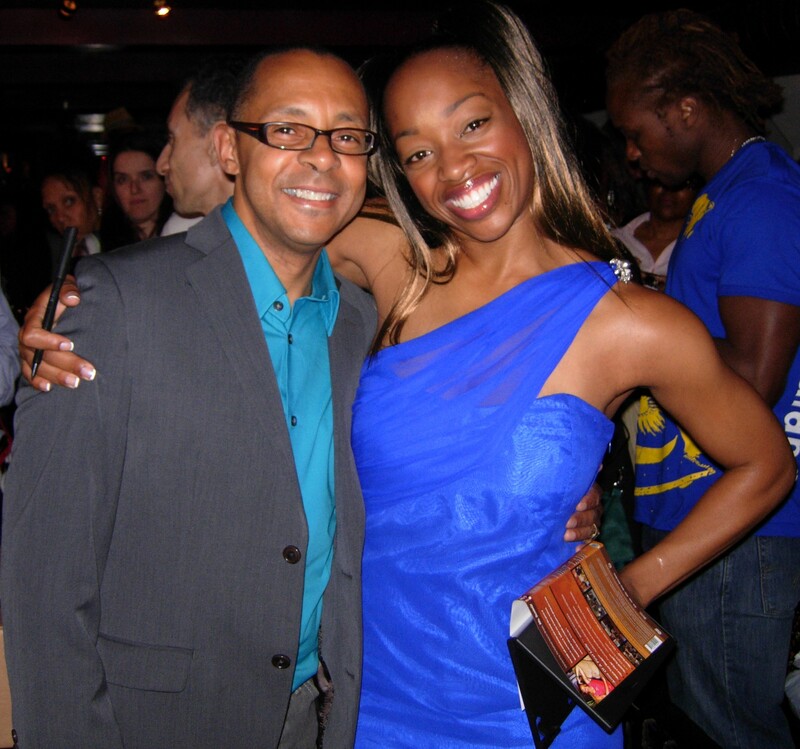 Dr. Jeff & SusieQ @ DVD Launch Party! “SusieQ is giving me Arms of a First Lady” says, Dr. Jeff Gardere, Psychologist, VH1’s Dad Camp – seen on CNN, FOX, NBC, MSNBC & Dr. OZ. 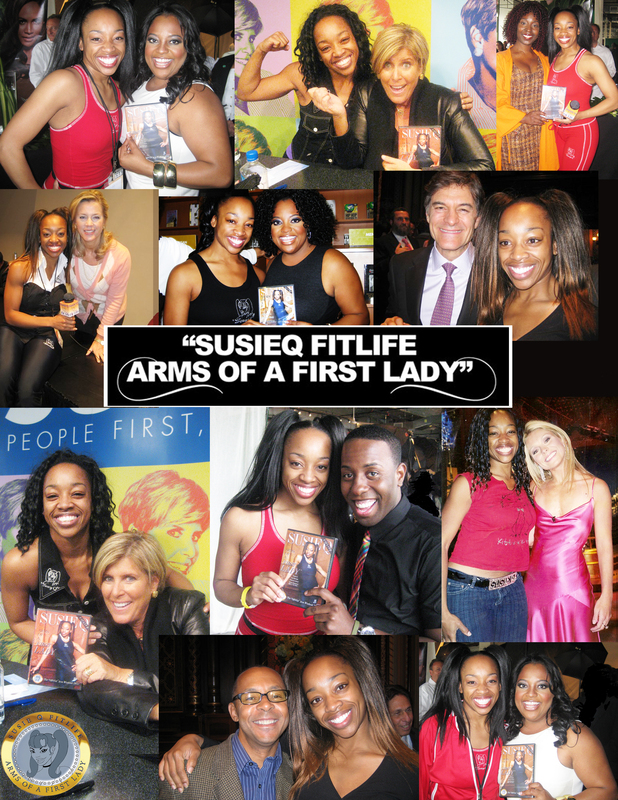 Owing “SusieQ FitLife: Arms of a First Lady” DVD is like having SusieQ, as your very own Celebrity Fitness Trainer, in your living room, motivating and challenging you! When training clients SusieQ always performs a full body assessment. This involves determining the individual’s body type, full body measurements, body fat testing, fitness level and personal goals to be attained. Only with this information can fitness programs and meal plans be put into place along with assistance, motivation and guidance. Finally, your goals can & will be accomplished, self-confidence restored and most essentially you will “Get a FitLife!” Even if you are not a TV Celebrity, SusieQ will make you feel like a First Lady or Mr. Hollywood (YES, Men FEEL the benefits too!) Get the (AOFL) DVD today! SusieQ as a young adult always struggled with weight issues and she turned to fitness and healthy eating habits. Fitness became a serious and personal passion. In elementary school she was active with track and field, shot put, long jump and high jump. Susie was always naturally competitive and began weight training in High school. She began walking to various gyms in her neighborhood for free gym passes to review their equipment and classes. Susie worked for the YMCA in Canada where she became certified as a Fitness Instructor and Personal Trainer. STOP! Reading My Story! I want to hear about your story! What Are You Waiting For? “Get A FitLife!” NOW!!! SusieQ is Armed with the STARS! Please Join in on the BUZZ! SusieQ is Armed with the Stars!